Evercore ISI analyst, Anthony DiClemente, says Snap is worth $US7 per share. The stock is currently trading at just under $US14 Monday. He’s bearish on the company, citing Facebook’s spending ability, Snap’s failure to take advantage of its user growth, and its lack of direct response advertising. Snap‘s stock price has taken a hit recently. Yet one Wall Street analyst still thinks the company is worth about half of where it is currently trading. Evercore ISI analyst Anthony DiClemente, one of Snap’s biggest bears, has a $US7 price target on the photo-sharing company. It is trading at just under $US14 Monday. And although Snap’s daily active user growth was 17% year-over-year in the third-quarter, well in line with Facebook’s fourth-quarter year-over-year DAU growth of 14%, Snap is still having trouble monetizing. “I definitely think the ads are skippable,” he says. “For marketers to put significant dollars to work, they need to provide measurement to the ad buyer, better tools to show whether or not those ads are effective,” he said. The separation between where users go on the app and where the ads are is another reason advertisers cannot see how effective the ads are. “A lot of the time people spend on Snap is in messaging, where the ad format ROI is less clear,” DiClemente notes. Users also cannot shop for products by touching ads on the platform, because most of the ads are “branded,” rather than “direct response.” Snaps branded ads are “really like a television ad,” DiClemente says, but “if it’s direct response,” the user can touch the ad, go to the advertisers’ website, and buy products. “That’s not the case” for Snapchat. 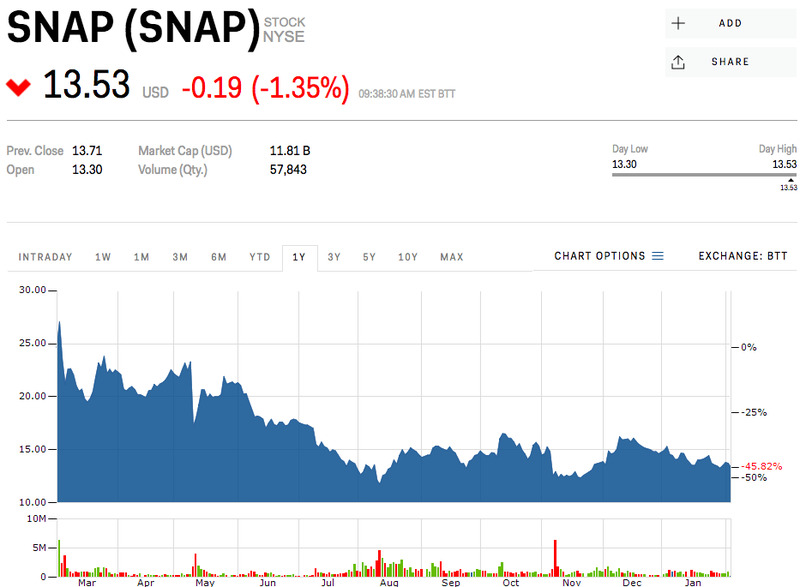 Snap is reportedly working to develop a self-serve auction platform where advertisers can bid on ad prices, but its ability to execute that goal “remains to be seen,” said DiClemente. Snap’s app redesign, which separates a users friends from publishing brands on the app, is also a risk. “Any time you have a replatforming, there’s a risk that there’s overall disruption in the business,” DiClemente said, adding that people may not like the change, and will flee from the platform. While he notes that Snap could be profitable at some point, he warns that Facebook’s Instagram has an “inherent advantage,” because it is a larger platform, and the company has a greater ability to spend. A $US7 per share price target implies a valuation of roughly $US8.37 billion, versus its current valuation of $US16.17 billion.